Glen Benton: Activist or Anti-Christ? Some of the people we view as great Americans have spent the better part of their lives being derided and defamed, only to later be discovered as incredible human beings. Harry Truman was a wildly unpopular President who was viewed as incompetent by many in the press. Today, he is viewed as one of the great Presidents of the modern era. Muhammad Ali was once believed to be a draft dodging, loud mouth braggart who was disgracing the sport of boxing and America itself. When the “Sportsman of The Century” lit the Olympic torch in 1996 in Atlanta, there was almost no mention of that. There are some people just like this in our world today. One such man inhabits the world of heavy metal. This local hero, defender of humanity, and social activist has sat quietly in the face of persecution for many years. 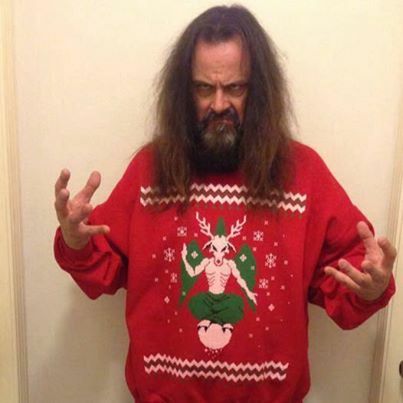 That man is Deicide vocalist Glen Benton. Most of Glen’s early works, much like those of Henry David Thoreau, focus on the abuses committed by the dominant religious system in America. In a world racked by grief and suffering, Benton posed questions like “How can you call yourself a God?” He also passionately revealed the mistreatment of God’s followers in his work with potent lines like “God is the reason we live in dismay, it is his will that this world is suffering”. After this intense period of anti-religious activism, Benton was directed by his own ethical compass inward to a more gentle period of his life. Thus began his “furry adoption phase”. 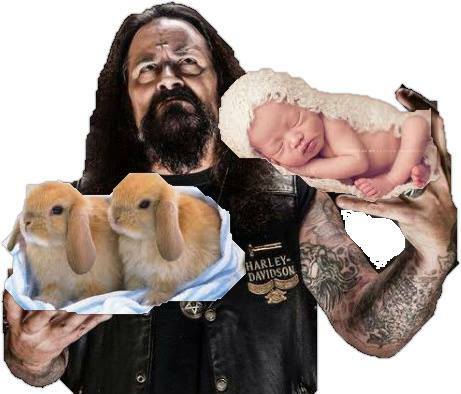 He began by adopting a few baby bunnies. The more bunnies he adopted, the bigger his heart swelled. At one time, the Benton house was home to over 300 baby bunnies. He adopted many other animals included wounded llamas, lemurs and aardvarks, but it was the bunnies that he forged the deepest connection with. This led to the most musically awkward phase of Benton’s career. In 1994, Deicide tried to release the album “Cute Little Bugs” which was rejected by the record label and later re-recorded the next year with different lyrics as “Once Upon The Cross”. The looming threat of commercial failure in the midst of soaring rabbit food costs was a wake-up call to Benton. He got back on the anti-God musical bandwagon in order to continue to support the incredible collection of animals who relied on him for sustenance. The next major event in Benton’s life is still shocking to many. On a gloomy late December morning, he received a knock on his door. When he opened it he found a young orphan left in a basket on his doorstep with a note that read simply “Jesus”. Benton, who could have easily eaten or sold the baby, instead committed the next years of his life to raising him, feeding him out of a bottle, and even going so far as to suckle him from his own teat. As he grew older, Jesus began eating sugary cereal, watching cartoons, and collecting Pokemon cards. In those days they were one big happy family- Benton, Jesus, and all 300 of the cuddly bunnies. He recalls that Jesus was just like any other normal kid, and that he often left crayons in his pockets which would melt in the wash. The mixing of Jesus and the bunnies under one roof is how our modern Easter tradition came about. We can all thank Glen Benton for that. However, when Mary and God, the child’s rightful parents, returned to claim him, Benton lost a bitter custody battle and had to say good-bye to young Jesus. Years later, Jesus was arrested and crucified by the Roman authorities for shoplifting. He still blames God for allowing the death of his young friend. Had young Jesus stayed in Benton’s care, the two would still be happily sitting on a couch watching episodes of Yo Gabba Gabba. Things turned out far differently. Still haunted by those terrible memories, Benton has spent much of the latter part of his career singing about Jesus’ unfortunate death. This was a dark and distressing period for Benton. He sought to make a strong statement about the injustices God had committed against his once foster son. He burned an upside-down cross into his forehead as a constant reminder of the grave injustice that had been committed. This act, while viewed as completely insane by some, has earned him the occasional comparison to the Buddhist monks who set themselves in fire in protest of the South Vietnamese government in the 1960s by those who understand Benton’s commitment to social justice. Since that time, Benton has been busy teaching a young generation not to die on crosses or listen to their idiot parents, even if they are God. He has constantly been portrayed in as negative light by the media, having been called the everything from a terrible influence on America’s youth to the Antichrist. The truth is, Benton an activist in the mold of Mahatma Gandhi, Nelson Mandela and Sean Penn. More than anything, Glen needs our love and understanding. Compassion for The Caco-Daemon is a non-profit group that has been started to collect letters of support and affection for Glen and his important cause. They are currently accepting handwritten cards (preferably in crayon) to encourage Benton to continue his fight. This entry was posted on December 23, 2013, 3:55 AM and is filed under General Weirdness. You can follow any responses to this entry through RSS 2.0. Both comments and pings are currently closed.